A screenshot appeared on the domestic game forum. In this non-public event organized by Gigabyte, the new X570 chipset of the AMD AM4 interface platform was exposed. 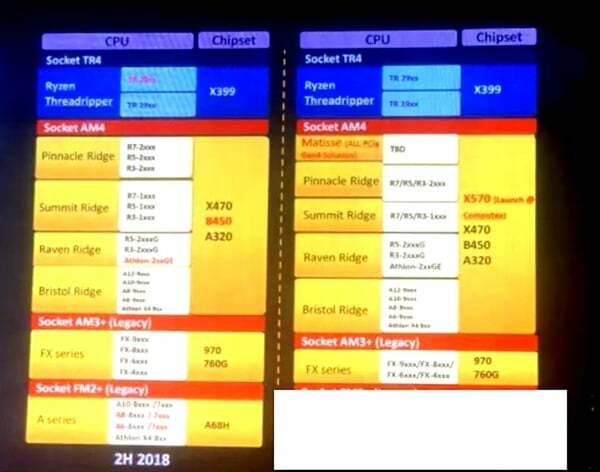 According to the picture, the X570 is scheduled to be released during the Taipei Computer Show next year. Companion to the X570 is the processor platform codenamed “Matisse”, the third-generation Acer CPU based on 7nm Zen 2. This exposure only previews one of the features of the X570 and AMD 7nm , which supports PCIe 4.0. The data shows that PCIe 4.0 doubles the bandwidth by 3.0 and comes to 64GB/s (x16). However, PCIe 5.0, which is doubling in speed as planned, is also scheduled for launch in 2019. In addition, carefully observe this picture, B450, Athlon 2xxGE is also marked as unreleased product, indicating that it appears very early (meaning that the possibility of official change is higher), but the credibility is still there. Currently, Zen 2 will be launched on the second-generation EPYC Opteron processor and will be available in the first half of next year.